It was all well and good deciding to skip the Uzbek and Kazakh deserts and the accompanying 45-degree furnace. 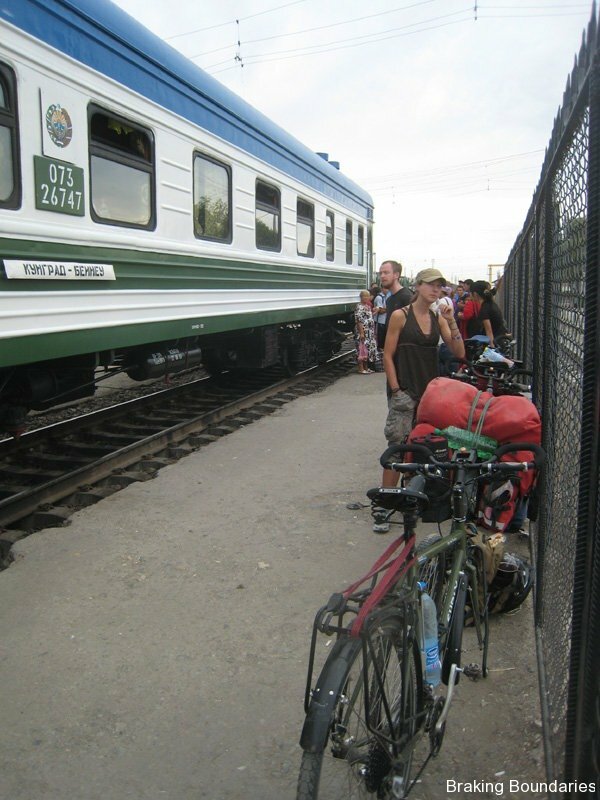 We still had the problem of getting three cyclists, bikes and bags all the way from Bukara to the port of Aktau in Kazakhstan. In this part of the world at least, the machinations of getting from A to B are never simple. It took 48 hours, two minibuses, a hundred mile edge of the seat ride in a Lada taxi with the bikes strapped to the roof, two trains, and a final 20km dash on the bikes to get here, all to be told we’d just missed the boat. Here are a selection of photos and happenings from the marathon journey. 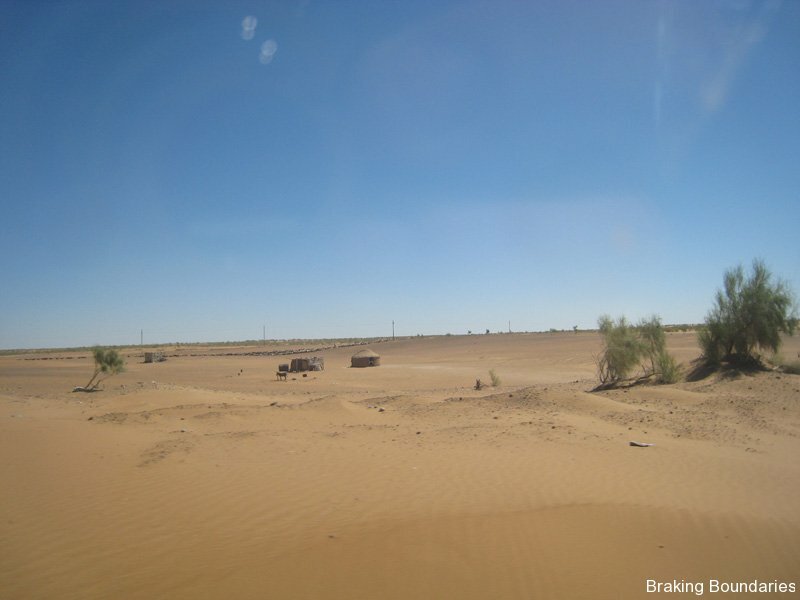 We left Bukara on Wednesday morning, catching a minibus to some nameless town whose name I never caught, and then transferring to another bus bound for Nukus. 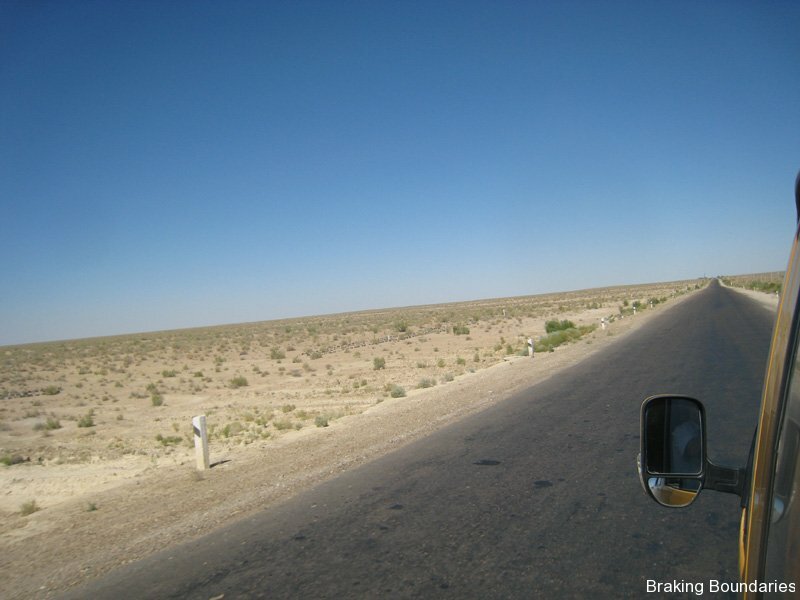 The barren desert landscapes being served up only strengthened our belief that we’d been right to skip out this stretch of Uzbekistan. 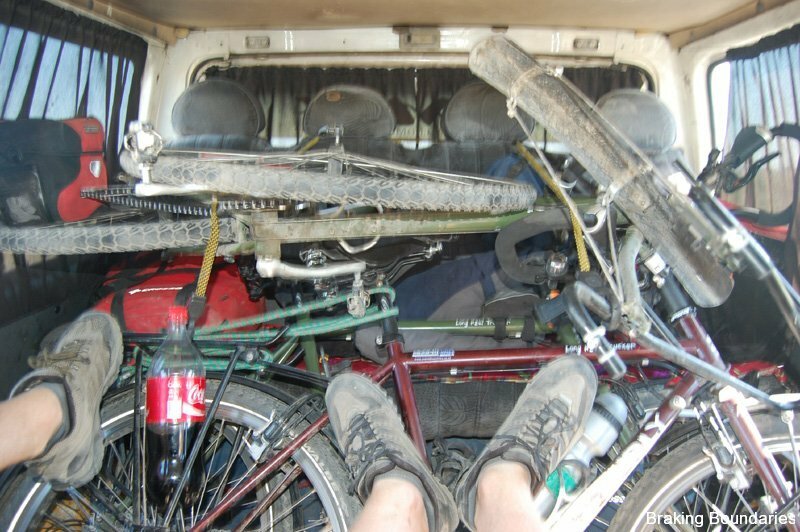 That jumble you see is three bikes tied precariously to the back seat with bungee cords and braced with my feet. 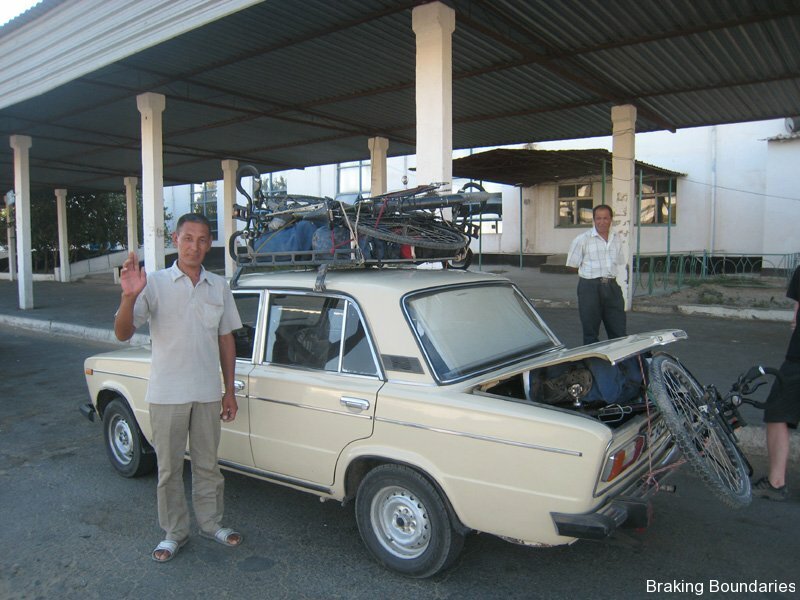 In Nukus we couldn’t find a minivan for the next stage of the journey, so we had to settle for a Lada taxi. How many bikes can you fit on a Lada? I heard a lot of Lada jokes when I was a kid, though this was not one of them. I’ve never seen a driver so keen to get a fare. He was absolutely determined to pack us and our belongings into the little car, throwing our bikes around with reckless abandon and no regard for the damage being inflicted upon chains, dérailleurs and spokes. The car was rust-speckled and of evident vintage. The front seatbelts were tired around the handbrake. Whether this was for neatness or to keep it in place, I couldn’t be sure. The speedometer didn’t work. Just as well, since the driver didn’t seem to give much regard to such trifling matters as speed limits. Perhaps to reassure Jared and myself or make us feel more at home, he spent much of the trip on the left side of the road, only swerving back to avoid oncoming traffic. We coasted over potholed roads with a suspension seemingly made from used slinky springs. The uneven road surface, if nothing else, kept us a a semi-rational speed. I spent the entire journey with my eye glued to the road. I felt that at least one of the car’s occupants ought to be doing so, having lost confidence in the driver when he began counting the money Jared had given him while driving through the city. 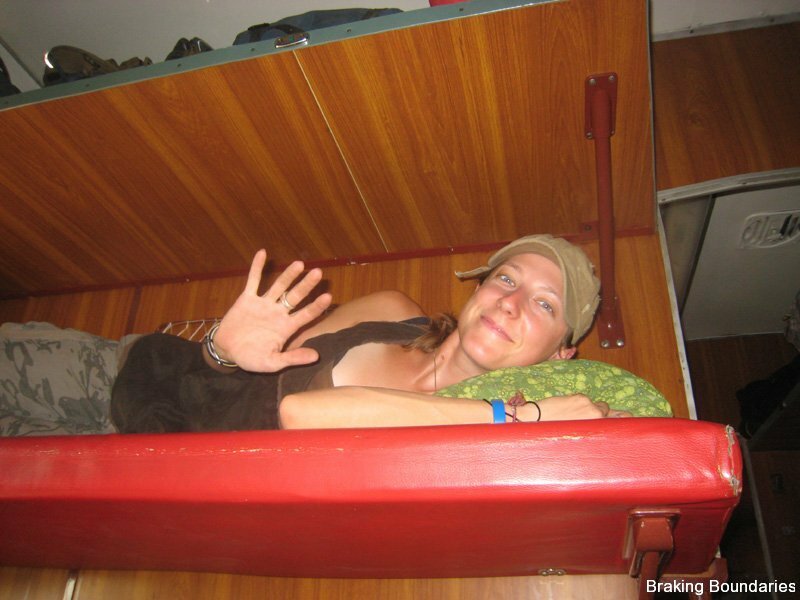 Our train wasn’t due to depart from Kongrad until the following morning, so we had to camp outside the town. Finding a campsite is difficult enough in daylight, even more so in the dark, and we ended up next to a patch of mosquito-infested swampland. We threw our tents up in mere minutes, but it wasn’t enough to avoid being eaten alive by the little buggers. They even got into Katie’s and Jared’s tents. The next hour was interspersed with the sight of headlamp beams panning around tents and the occasional swatting sound that marked a successful kill. The train from Kungrad to Beinau was hot and crowded. We managed to grab some half-decent seats, and even snagged a bunk which we were able to use on a rotational basis. 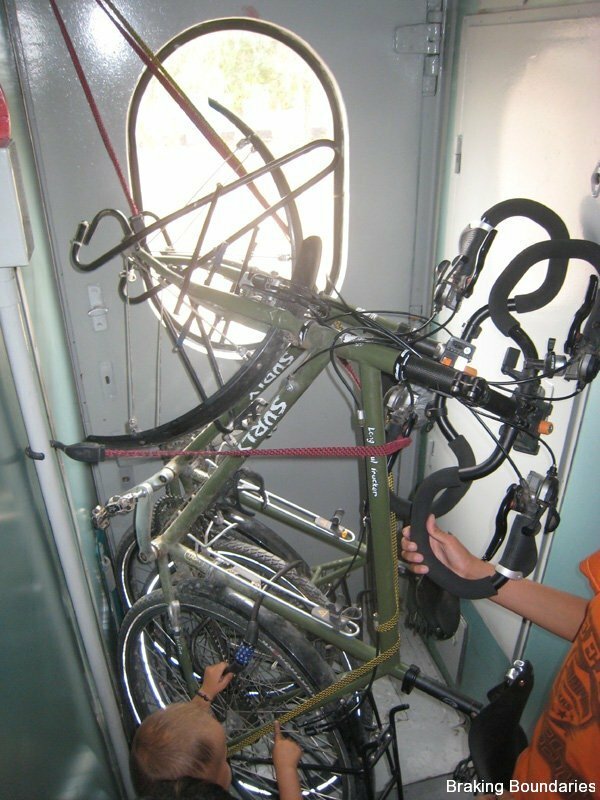 Our bikes were crammed into a crawlspace between the carriages. I winced a little at the continued pummling being inflicted upon them over the course of the journey. A constant stream of vendors roamed through the carriages, peddling their wares. There were so many hawkers, sellers, and money changers that it seemed as though only half the people on the train were actually passengers. Jared made a video of the action, which you can see elsewhere on the website soon. 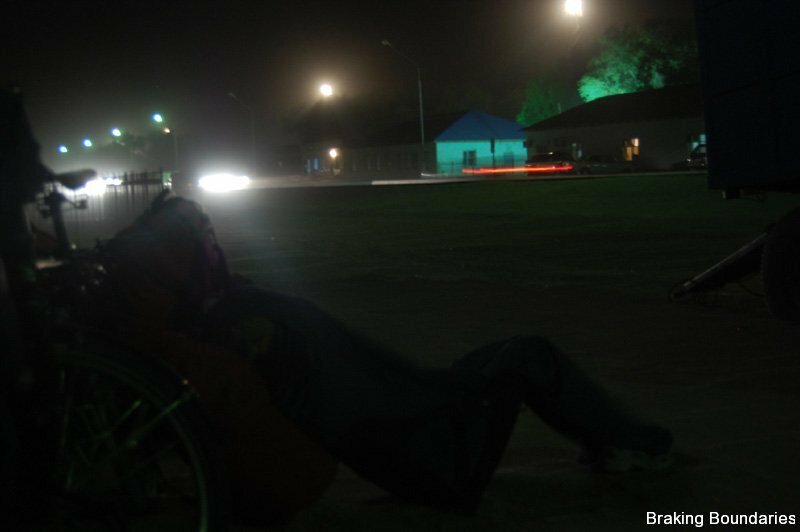 We arrived in Beinau late Thursday evening, but had to wait several hours for the night train to Aktau. We grabbed a bite to eat in a nearby cafe, and settled . 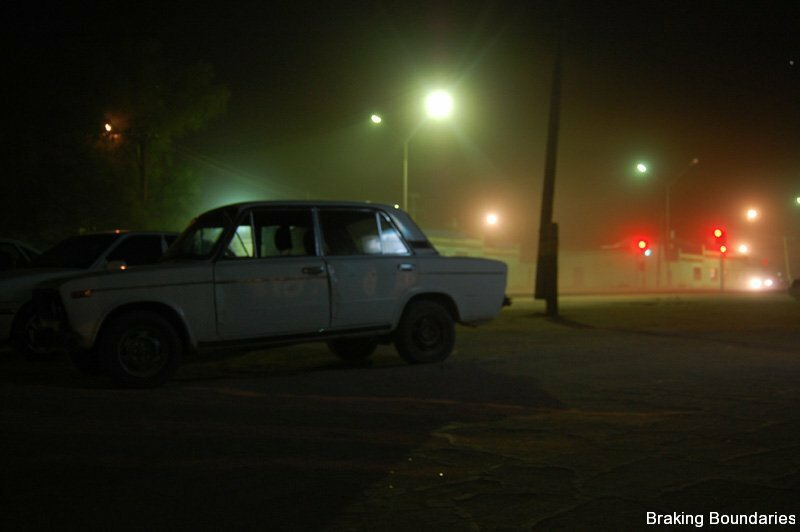 A dust storm was blowing through the town, and we sheltered from the billowing dust as best we could. After all that traveling, we finally made it to Aktau on Friday morning, over 48 hours after leaving Bukara. We were somewhat startled to learn that the train station was over 20km from the city and port. The last 20km by bike was slowed by headwinds and, in my case, a not-so-slowly deflating tyre which needed to be pumped several times along the way. Some days you just ought to stay in bed. We arrived at the port only to be told that there was a ferry, but that it was preparing to leave. Even if we had been in possession of our Azeri visas, which we weren’t, we wouldn’t have been allowed to enter. There simply wouldn’t have been time to grab tickets, clear customs, and roll up the gangway. With no actual schedule of posted sailings, it was always going to be a stab in the dark. Still, knowing we’d missed the ferry by such a close margin was a little disheartening, especially after doing everything possible to get to Aktau in record time.